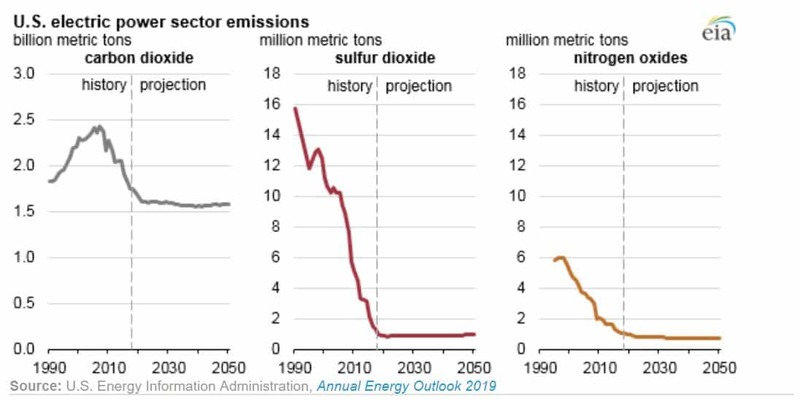 U.S. electric power sector emissions of sulfur dioxide (SO2), nitrogen oxides (NOx), and carbon dioxide (CO2) will remain mostly flat through 2050, assuming no changes to current laws and regulations, according to the EIA’s recently released Annual Energy Outlook 2019. Regulation has greatly contributed to the decline of pollutants like SO2 and NOx from the electric power sector, as well as other toxic air pollutants associated with fuel combustion such as mercury, arsenic, and heavy metals. For CO2, the pollutant most commonly associated with the increased greenhouse effect and climate change, the agency projects that electric power sector emissions will remain relatively unchanged throughout the report’s projection period, decreasing just 0.1 billion metric tons from 2018 through 2050. By 2050, U.S. electric power sector emissions of the greenhouse gas will be about 1.6 billion metric tons, or nearly equal to what they were in 1984. However, the agency also expects a 23 percent increase in electricity generation from 2018 to 2050, which will come mostly from natural gas and renewables, emitting less or no carbon dioxide. Combined renewables generation capacity across all sectors will increase by almost 400 gigawatts by 2050. The next largest source of added generation capacity will be from natural gas at about 360 gigawatts.